Students at Rockridge and across our school district are doing some inspiring things. I continue to be in awe of their willingness to take risks with their learning and venture out of their comfort zones to pursue areas of interest and grow as knowledgeable, caring citizens of our world. Sixteen-year old Fallon O’Neill is an example of a student doing just that. Fallon emailed her Social Students teacher, Ms. Selzer, requesting a homework extension. It was an unusual request for this organized, responsible Grade 10 student. “I was wondering if I could have a two day extension on the term paper. I was on track to finishing on time, but I was elected as head representative of BC at Forum. This means that I must prepare and perform a speech on issues that youth face in BC in front of all of Forum, and then, later, the Members of Parliament…”. I’d consider that a pretty valid excuse, wouldn’t you? 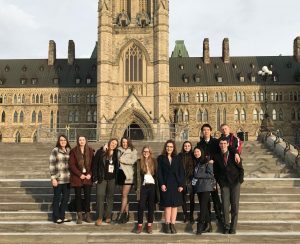 Fallon’s teacher had suggested Forum for Young Canadians might be a great opportunity and encouraged students to consider applying. Fallon decided to complete the application form and much to her delight, she was accepted to attend Forum in Ottawa at the end of February. I sat down with this open-minded student to learn more about her experiences in our nation’s capital and ask what had prompted her to apply. “I thought it would be a great networking opportunity.” OK, so a teenager is thinking about networking? I don’t know about you, but networking wasn’t foremost on my mind when I was that age. I was already impressed. Forum for Young Canadians is a week-long event that brings youth together from provinces across Canada. Fallon was one of eighteen delegates selected from British Columbia. After arriving in Ottawa, the B.C. contingent gathered together with a moderator in their hotel to decide which student would be selected to represent them. With a bit of trepidation and in the spirit of being a risk-taker, Fallon raised her hand after it was noted that the seven hands already up were all males. The eight B.C. candidates were then charged with the task of preparing a short speech to deliver to their fellow delegates outlining issues facing youth in our province. Fallon listened intently to the speeches of her male counterparts that focused on hot political matters like the trade agreement and pipeline issue. She admitted that those topics weren’t really ones she was keen on exploring so instead, she concentrated on the education system and social concerns. This proved to be a wise decision as she was elected B.C.’s representative. At this point she needed to prepare her speech which, understandably, was her priority. That Social Studies term paper would have to wait. And of course, her teacher agreed. During the reception of the Members of Parliament, Fallon shared the priorities of the B.C. delegates as well as other key issues transcending all provinces, including youth mental illness. When reflecting on her time in Ottawa, Fallon was candid with me. It was a powerful experience and very eye-opening. As a Canadian citizen, her frustration at not being able to interact with the French-speaking delegates was evident. “I knew they would be speaking French, but I just didn’t get how much of a barrier that would be. We live in the same country and I couldn’t understand them.” Another enlightening moment for Fallon was listening to First Peoples’ issues from delegates living on reserves. Fallon enjoyed speaking with Senator Martin from B.C. about the immigrant/non-immigrant divide in high schools. Martin, an immigrant herself, was curious about Fallon’s experiences at high school. Fallon shared that she did not feel it was an issue at Rockridge but was interested to hear that such divisiveness exists in schools elsewhere in B.C. and across the country. 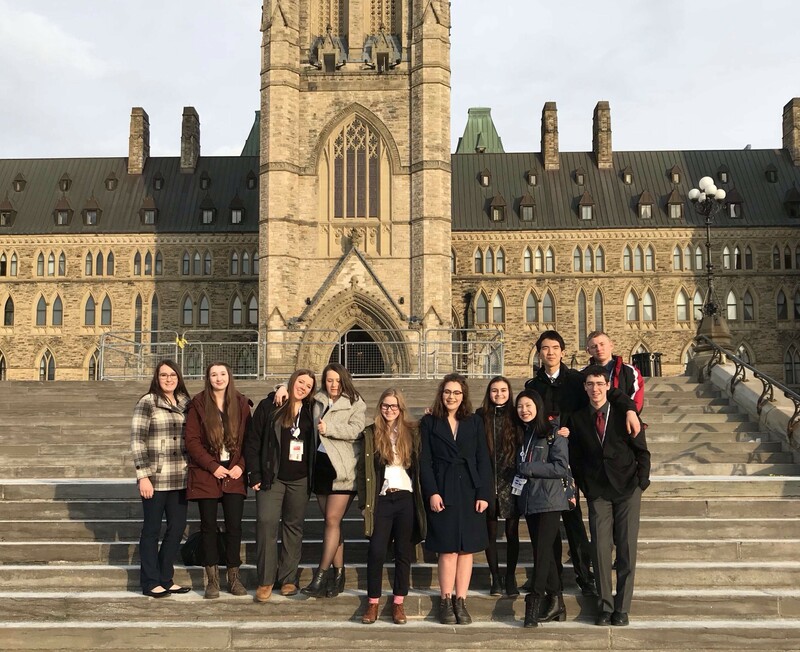 At the conclusion of their time in Ottawa, the students had the opportunity to attend Question Period in the House of Commons. I was curious as to Fallon’s thoughts on that experience. She smiled and with considerable animation replied, “I knew there would be heckling as I’d heard it on TV, but nothing compared to being there in person. They were acting like children! It wasn’t how I expected government officials to behave.” We both had a good laugh about how adults sometimes lack self-regulation! Fallon returned to Vancouver wiser, enlightened, and inspired. I am so proud of her for being a leader amongst leaders. I admire her for being a risk-taker and pursuing such a wonderful opportunity that will undoubtedly impact her thinking moving forward. Her humility and maturity impressed me. I am sure we haven’t seen the last of this quiet force. Well done, Fallon. Many students aspire to deepen their knowledge and understanding in a particular area of study or, like Fallon, hope to network with like-minded individuals passionate about making a difference. Yet not all students may be aware of the many opportunities they could be accessing or perhaps they don’t have the confidence to even contemplate applying for them. It may just take a nudge from a parent, a teacher or a friend to encourage a young person to pursue the plethora of opportunities that await. No harm in simply saying, “Go for it.” Sometimes that’s all it takes.